Rats have been used as a model for humans for over 150 years. Rats were the original animal model with the use of mice becoming more prevalent due to the development of transgenic mice models. And simply due to their larger size, rats are easier to handle and are better suited to transplantation research and repeat bleeds. Now that the rat genome has been mapped and knock in and knock out transgenic rat strains are available the rat model may become used more widely. When designing your experiment it is important to consider the target cell frequency. The numbers of cells that need to be stained to collect a statistically relevant number of positive or negative cells need to be understood. This way you can avoid having to repeat the experiment simply due to the lack of statistical significance. Table 1 shows the relative frequency of cells in commonly used rat tissues. Go to our dedicated cell frequencies page for more detailed information. Table 1. Rat immune cell frequencies. Table 2 lists markers that can be used to determine different immune cell lineages. Table 2. Rat lineage markers and antibodies. As rats can be used in many research areas, there are a large number of commonly used markers. Table 3 lists key markers to identify various cell types. Table 3. Key rat markers to target cell or research area along with available antibodies. Mouse Anti-Rat CD44 Antibody, clone OX-50 recognizes the rat CD44 cell surface antigen, also known as Extracellular Matrix Receptor III. CD44 is a 482 amino acid ~85 kDa single pass type I transmembrane glycoprotein, expressed by T cells, B cells, macrophages and thymocytes. Mouse Anti-Rat CD4 (Domain 2) Antibody, clone OX-35 recognizes the rat CD4 cell surface antigen, a ~55kDa glycoprotein expressed by helper T cells and weakly by monocytes. Rat markers CD44 and CD4 have been used in flow cytometry (Figure 1), showing T cell, B cell and macrophage populations. Following this, CD4 has been used in immunohistochemistry showing T cells. Fig. 1. Flow cytometry analysis of rat makers CD44 and CD4. A, A647 conjugated Mouse Anti-Rat CD4 (MCA153A647) and RPE conjugated Mouse IgG2a Isotype Control (MCA1210PE). B, A647 conjugated Mouse Anti-Rat CD4 (MCA153A647) and RPE conjugated Mouse Anti-Rat CD44 (MCA643PE). All experiments performed on red cell lysed rat blood gated on mononuclear cells. Fig. 2. Immunohistochemistry analysis of rat marker CD4. CD4+ T cells clustering around central arteriole in the white pulp of rat spleen (cryosection) stained with MCA153. Bio-Rad has an extensive range of rat monoclonal and polyclonal antibodies guaranteed for use in applications such as flow cytometry, western blotting, immunoprecipitation, IHC and, ELISA. These antibodies are available in various formats, however if you can’t find the format you need, you can also choose from a range of easy-to-use conjugation kits. These anti-rat antibodies are targeted against markers for study in various research areas specifically immunology, pathology, toxicology, neurology and transplantation. Bio-Rad has one the most comprehensive range of ED clone anti-rat antibodies primarily for the study of macrophage subtypes but also other related molecules. Table 4. ED clone anti-rat antibodies, marker and cell type. Abbreviations: E, ELISA; FC, flow cytometry; IF/ICC, immunofluorescence/immunocytochemistry; IHC-F, immunohistochemistry-frozen; IHC-P, immunohistochemistry-paraffin; IP, immunoprecipitation; WB, western blotting. Mouse Anti-Rat CD11b Antibody, clone ED8 recognizes a membrane antigen on rat macrophages, monocytes, dendritic cells and granulocytes. It also recognizes small ramified microglia in the central nervous system. Mouse Anti-Rat CD106 Antibody, clone MR106 specifically recognizes rat CD106, otherwise known as VCAM-1 (vascular adhesion molecule 1), an 110kDa inducible type I transmembrane glycoprotein. It is predominantly expressed on vascular endothelium, and also on bone marrow stromal cells, follicular dendritic cells and some macrophages. Rat markers CD11b and CD106 have been used in flow cytometry (Figure 3), showing myeloid cell populations. In Figure 4 immunofluorescence staining of CD11b alongside CD4 in rat spleen shows macrophages and T cells. Fig. 3. Flow cytometry analysis of rat makers CD11b and CD106. A, PE conjugated Mouse Anti-Rat CD106 (MCA4633PE) and FITC conjugated Mouse IgG2a Isotype Control (MCA1210F). B, PE conjugated Mouse Anti-Rat CD106 (MCA4633PE) and FITC conjugated Mouse Anti-Rat CD11b (MCA619F). All experiments performed on red cell lysed rat bone marrow gated on mononuclear cells. Fig. 4. Immunofluorescence analysis of rat marker CD11b and CD4. CD4+ T cells (red) stained with MCA153 and CD11b positive macrophages (green) stained with MCA619 in rat spleen (cryosection). 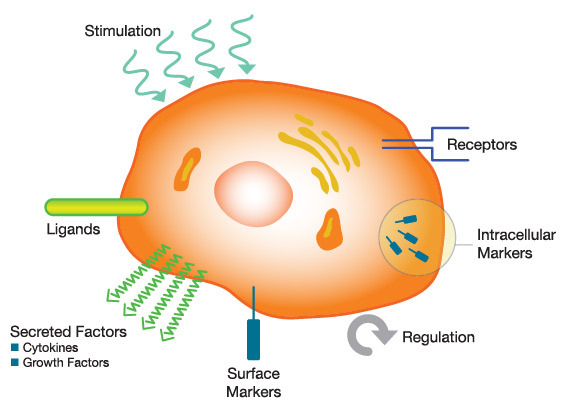 Flow cytometry, a method to measure and characterize cells, can be used in standard procedures such as cell counting, cell sorting, biomarker detection and protein engineering. Bio-Rad offers many anti-rat antibodies that are guaranteed for use in flow cytometry and come conjugated to a variety of different fluorescent dyes, in addition to pre-prepared 2, 3 and 4 color cocktails. Bio-Rad also provides all the reagents required in a flow assay, such as viability dyes, FC block and flow cytometry kits and a large range of mouse isotype controls. Finally you have access to a wealth of educational resources to support your flow assay including guides, posters, webinars and practical help and advice. Table 5 shows example panels with common surface and intracellular markers for rat peripheral blood and secondary lymphoid tissue to identify different cell populations. Table 5. Rat flow cytometry panels. Note: Rat T cell panels must contain CD3 as monocytes are positive for CD4.